SmartsStore.com.au ensures that your purchases are shipped out within 1-2 days of payment being received. Depending on your location and the type of goods you have purchased, SmartStore.com.au will dispatch your goods with 1 of 3 transport providers. Once the parcel has reached your local delivery centre it will be scanned at trackable at http://www.auspost.com/track . Each parcel carries a barcoded address label, which is scanned at several points during the delivery process. Parcels are collected from our premises upon request on a daily basis (Monday to Friday). On arrival at the freight depot they are sorted and scanned into their corresponding states for shipping on the next day. According to Toll IPEC’s delivery policy, the driver is not allowed to carry any items into customers' properties such as units, business buildings or any other flat buildings which are located in upper levels. Please note that the proposed delivery time is taken for whole day and extra charge will be included if special arrangement for delivery is requested. In order to provide postage discounts on multiple items, SmartStore.com.au would need to dispatch all items together. 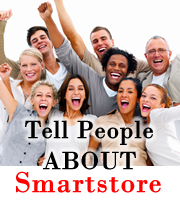 SmartStore.com.au does not usually do this as it impacts on the speed with which items can be provided to the customer and reduces the flexibility which allows us to provide you with such a wide range of products. However, we remain convinced that even with postage costs taken into account, we are the most competitive online seller in Australia. Currently, SmartStore.com.au calculates postage costs on a per item basis. This is done in order to ensure that each item can be individually dispatched and tracked through the delivery process, from us to your front door. Our experience has been that customers value the added security this dispatch system provides. SmartStore.com.au subsidises the postage costs for a number of items to ensure that our stock turns over quickly and we provide our customers with the best possible deal. Please also note that the postage costs for each item include full transit insurance. Failed Delivery Attempt . If you are not at home when your package arrives and it was being delivered by Auspost, a card will be left in your letter box so that you can pick it up from your local Post Office. If your package was being delivered by Toll IPEC Management arrangements will be made in advance to ensure that your package can be delivered at a time convenient to you. Should you not be at home at the agreed time, a redelivery fee may apply.